The discovery of a 6,500-gallon brick-and-cement cistern next to the Rotunda sheds new light on some of the history of the Grounds’ construction. The cistern likely helped solve a water shortage problem for the University during the 1800s. 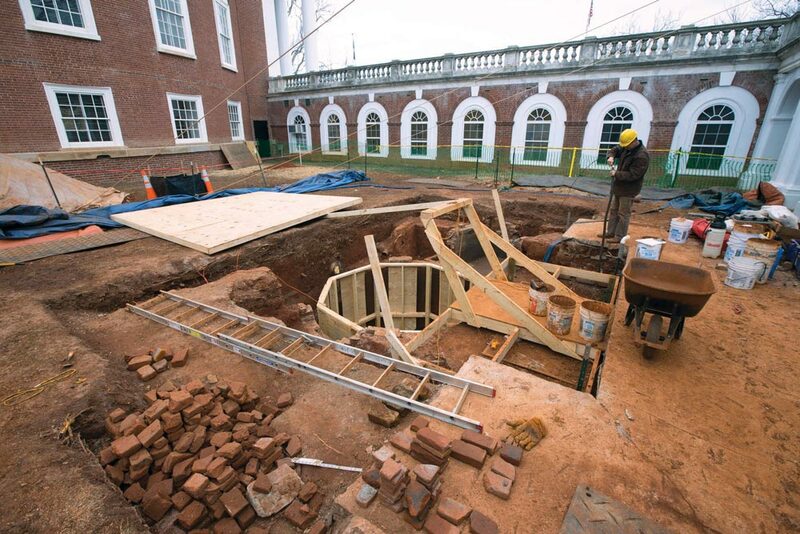 Archaeologists found the 11-foot-deep cistern last spring during excavation work that is part of the Rotunda’s renovation. Initially they believed it was put into place in the 1820s, but after discovering the names of workers carved into the cistern’s side, officials were able to date the cistern to around 1851. UVA was beset by water shortages in its early years because it was built on a hill. The cisterns, which collected rainwater, helped solve that problem, and were used primarily for drinking water and fire protection. After digging out more of the cistern—it had been filled with more than four tons of clay soil since the early 1890s—archaeologists found the names of two workmen, Charles Carter and J.W. Brand, carved into the cistern walls. Stephen Thompson, an investigator for the archaeological excavating firm, believes Brand attended UVA from 1853 until he received his medical degree in 1856. The University paid his father, Chiles Brand, for brickwork and plastering for three cisterns in 1851, Thompson says. There is little information available on Carter. Thompson believes he was one of Brand’s workmen. University masons carefully removed sections of the cistern wall, which will likely be displayed in the Rotunda after the renovation. Some of the cistern’s bricks will be used for historic repairs in the Academical Village.